The Japanese giant launched its first Android powered camera phone, the Lumix DMC-CM1, which has already gingered quite a bit of an interest at Photokina 2014. This camera phone is a boon companion to the photo enthusiasts who are sure to fall in love with a good Smartphone with an incredible camera. CM1 is world’s slimmest communication camera. Is this device a camera or is it a phone; well it’s a combination of the two, camera as well as a phone as the name indicates. Lumix is Panasonic’s camera brand and “communication camera” abbreviated as CM. It is more of a camera phone than a phone camera which combines the high-end camera technology with the latest Android OS. From an aesthetic sense, the CM1 looks like a Smartphone on one side and like a high end compact camera from the other. Lumix CM1 is heavy at 204 g and is thick at 21mm, even thicker than the chunky Lumia 930 Windows Phone, which is no big surprise considering the large image sensor. In spite of this the thickness makes it feel natural to hold while using it as a camera than does a super slim Smartphone. The shutter button to the top is well positioned and falls naturally to the thumb. It does not in any way come in between the phone volume controls or the on/off buttons. 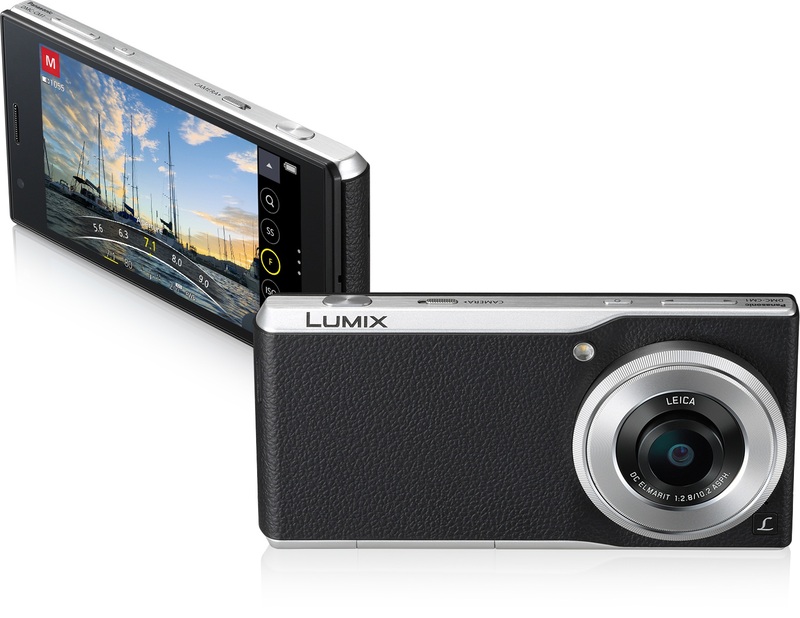 Comparing a standard camera with the Lumix CM1 its thin aluminum construction makes it lightweight. It sports a 1-inch size MOS type sensor with 20-megapixel chip with an f/2.8 Leica branded equivalent wide-angle DC Elmarit lens. It comes with a mechanical shutter and a manual control ring surrounding the lens that rotates to control the default settings like focus, aperture, shutter speed, ISO and white balance. The default settings can be adjusted manually with the ring or mechanical click wheel around the lens on the front of the camera/phone. The lens remains flush to the control ring when the camera is off, but can protrude to focus when the camera is on. The protrusion is not to a huge amount but only visibly. However, there is no optical zoom, but you can click and drag to zoom in on the screen by up to four times. The Smartphone functioning and processing is taken care of by a 2.3Ghz quad-core Qualcomm 801 chip set and the camera functioning and processing side of things is taken care of by the camera switch Venus Engine. With Venus Engine the camera can function independently; it does not require any of the Smartphone’s power to operate. CM1 sports all the built-in essentials that any modern Android flagship has. It has all the all the GHz and RAM and mAh. Unlike some other Smartphones there is no removable battery. The Lumix CM1 camera-phone is capable of recording 4K video and Raw images, a feature seen in many Smartphones like Samsung Galaxy S5, Sony Xperia Z3, and Moto X (Gen 2). The device runs Android 4.4 KitKat out of the box. It is powered by a 2.3GHz quad-core Qualcomm Snapdragon 801 processor with a 2GB RAM, a 4.7-inch full HD (1080×1920 pixels) display. It supports 4G LTE networks, Wi-Fi, Bluetooth and NFC, dialing and attending calls; It comes with 16GB of inbuilt storage, expandable up to 128GB via microSD card. It is backed by a 2600mAh battery. The CM1’s 1-inch 20MP sensor is the same imaging unit used by other recent high-end compact cameras like Sony’s Cyber-shot RX100 III. The CM1 sensor is large, more than two and a half times the surface than that of Samsung Galaxy S5. The large sensor coupled with an F2.8 Leica lens offers a focal length of 28mm which is by far the best camera specification on any Smartphone and the 20MP resolution provides a good-quality digital zoom. CM1 can deliver stacks of settings, a feature which other Smartphones cannot. You just need to hit the virtual quick menu button and select all kinds of options like autofocus area, white balance, RAW and JPEG etc. The device is going to cost more than a pretty penny because anything with the name Leica on it demands big money. You can clarify this if you compare the prices of Panasonic Compact and Compact System Cameras with the same cameras that happen to bear the Leica brand name. The Leicas cost a few hundred dollars more. Panasonic will be showcasing the device at Photokina show next week in Germany. A test unit of the device is not available; so it has not yet been tested to see how it fares against the Nokia Lumia 1020. No details on regional availability are known yet. The CM1 will be available for 900 Euros, approximately US$ 1160 from November in some countries. Nowhere on the web have I found the material of the display. If it is plastic, not glass, this would be a deal breaker for me.